Our panoramic view of Lake Tahoe will take your breath away from the moment you walk in the door. A photograph is only able to capture a third of the view you will be enjoying from two blocks above the lake. 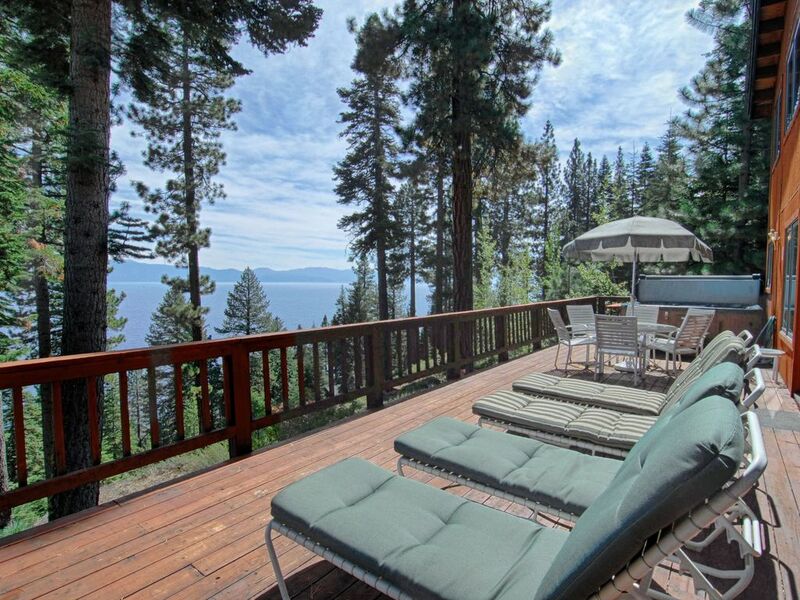 You will delight in the beauty of Lake Tahoe while soaking in the hot tub as well as relaxing inside the house. It is wonderful to sit in the hot tub and watch the sunset over the water while sharing drinks and conversation with friends and family. It is equally wonderful to sit in front of the fire and look out at the lights around the shore-line and the moon reflected in the lake. Our home is situated on an acre with large trees and open sunny areas. It is beautifully furnished and completely equipped. Unlike most rental properties, our home is equipped for our enjoyment as well as yours. We have a large wood stove with a view of the flames, and we provide the free firewood. In the winder we provide a snowplow service to keep the driveway clear, and we have a large two-car garage. In the summer we provide outdoor furniture including a dining set and lounge chairs on our 60-foot deck which runs the full length of the house. Our home is perfect for a honeymoon as well as for a family vacation! If you e-mail us, please include your phone number so we can talk to you personally and answer all your questions. Great house for 5 adults and a baby. Really well equipped kitchen. Beautiful lake views. The view was amazing, and the layout of the house was very nice as well! Everything was great! Beautiful property. Great view of Tahoe. Open and modern kitchen. Two washers and two dryers. We spent Thanksgiving here with our two grown children and their spouses plus our two retired guide dogs. The home has a panoramic view of the lake and a large fireplace with ample wood. The garage is clean and warm and was a great place to keep the dogs. It snowed a bit and the plow service was here to take care of the driveway. We used the Barbecue and the hot tub on the deck. There is a new oven and dishwasher that were put to good use. We live in Folsom and this was a great find for us. The hosts were very nice and responsive. Their place is nothing short of breathtaking! You feel like your living in a postcard. Accommodations were great! Absolutely loved the deck and hot tub. The view is gorgeous. Property is cleaned and well maintained.